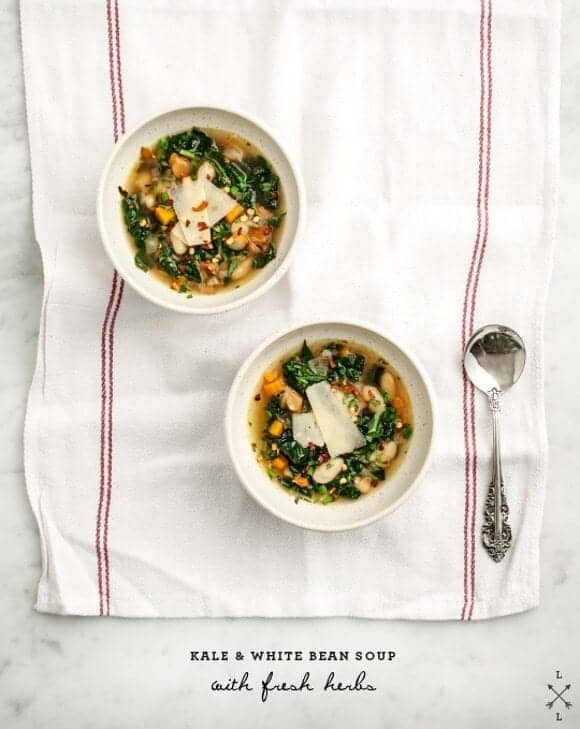 This White Bean and Kale Soup is full of vegetables & herbs and gets plenty of zing from white wine & sherry vinegar. 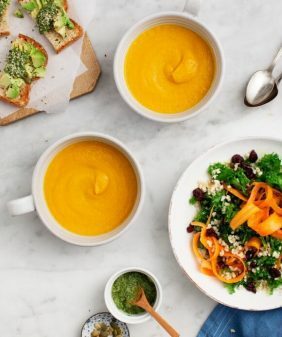 A hearty, healthy winter meal! I just love making soups. There’s something so cozy and comforting about the whole process. It hasn’t exactly been soup weather around here, so last week when it dipped down into the 60’s, a stay-home, curl-up-on-the-sofa, soup night (and this white bean and kale soup) happened. It’s hearty, but still kind of light. 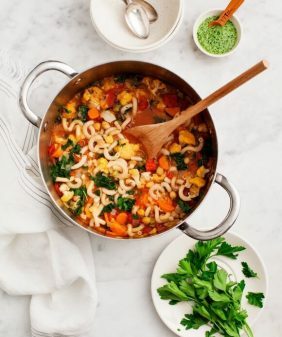 The beans and kale give this soup plenty of staying power, and it’s satisfying to eat. But at the end of the day, you’re still enjoying a bowl full of veggies. It gets better on the second day. This white bean soup is great left over! Save a serving to take for lunch the next day. It’s easy to make. Just chop, sauté, and simmer, and dinner will be on the table. It’s flexible. If you don’t have the exact veggies or herbs listed in the recipe, swap in what you do have. For example, I went out of my herb comfort zone here and used tarragon, but basil would also be delicious. What makes this White Bean and Kale Soup so good? 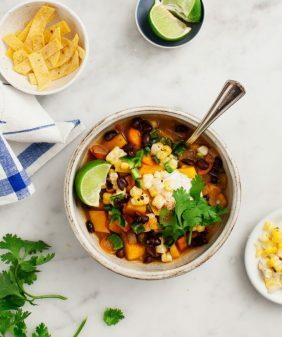 Carrots, shallots, and garlic add veggie power and aromatic flavor to this soup. Sliced mushrooms bring satisfying texture and umami flavor. White wine and sherry vinegar make it zingy and bright. White beans thicken this soup and bulk it up. Kale brings myriad nutritional benefits & bright green color, and, with the white beans, it makes this soup a meal on its own. And last but not least, plenty of herbs give it a wonderful fresh taste. 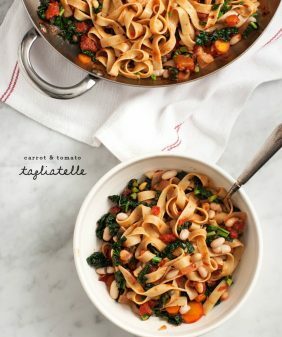 This White Bean and Kale Soup is a healthy vegetarian weeknight dinner! We love it served with a shaving of cheese and slices of crusty bread. In a medium pot, heat the oil over medium heat. Add the shallots and a few pinches of salt and pepper, and cook until they’re beginning to turn translucent, 5-7 minutes. Add the carrots, garlic, mushrooms, and a pinch of salt and stir. Continue cooking until the mushrooms wilt down, another 10 minutes or so, stirring occasionally (turn down the heat on your stove slightly if your vegetables start to burn). Add the white wine and stir to get the bits off the bottom of the pan, and cook until the liquid reduces, 5-7 minutes. Add the broth, white beans, and rosemary and bring to a boil. Add the kale. Reduce heat and simmer for 15-20 minutes or so. Mix in the sherry vinegar, tarragon, and chives. Toss in a few pinches of red pepper flakes. Taste and add more salt & pepper to your liking. 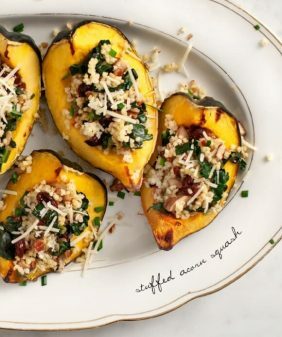 Serve with freshly grated Parmesan cheese and crusty bread. I know, I discovered tarragon only recently. I need to try planting some so I can have it around more often! Kale/escarole and white beans soup has crept its way up to probably my favorite soup…can’t get enough in the winter–even here in seasonless Los Angeles! Yes! 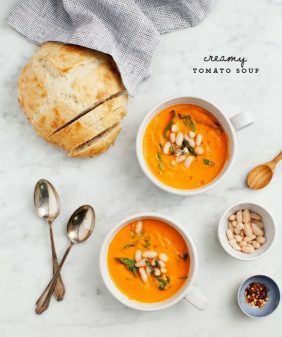 This soup looks perfect. I haven’t experimented much with tarragon and am not even sure if I know what it tastes like. Guess it’s time to give it a try. The shaved parmesan on top really seals the deal. Yummm. Hooray for soup! Kale and white bean is one of my favorite combinations. 🙂 Looks great! What a lovely, healthy looking soup. It’s summer here in Australia so will have to bookmark this recipe for winter. It’s been chilly and rainy and soup and sofa night sounds just right. I’m always drooling over your beautiful shots. 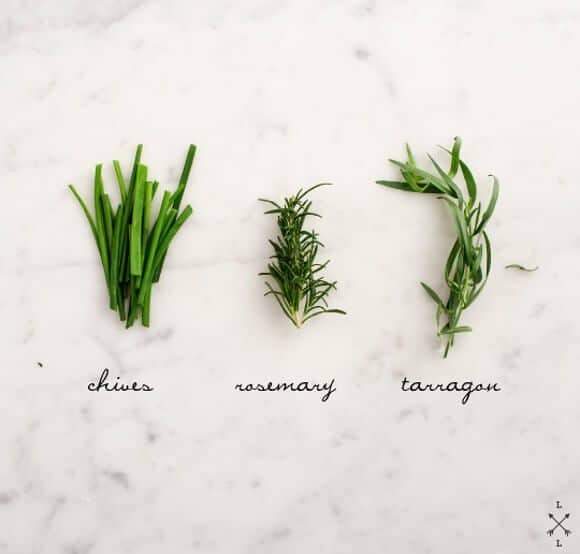 You just went and made herbs look gorgeous and I want that shot on my wall! I usually like to make a nice batch of soup early in the week for lunches. I haven’t gotten around to it yet this week but I think this is the recipe that I need to make! We made this last night and were amazed at how good it was. The sherry vinegar really makes it bright and delicious. The tarragon + white wine made this into something really special. We all liked it! I used dried cannellini beans and cooked them in the crockpot earlier in the day so they were ready to use when the time came. Can this be stored and reheated? yes, drain and rinse the beans, then add them to the soup (thank you! I’ll correct this). Should the beans be drained? Oops pls disregard I didn’t think my question posted earlier. Hello can this recipe be frozen and reheated? Hi Carolyn – yes, it can!